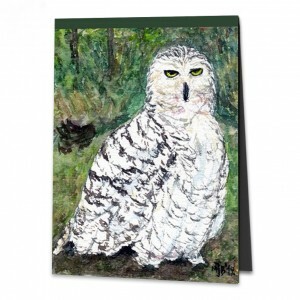 ‘Are there owls?’ – ‘When will you have owls?’ – ‘Why haven’t you painted any owls yet?’ Many people ask me – and so I made a mental effort to search for some of these shy, nocturnal creatures. Would I find them in the forest, in a barn, in old ruins? I don’t think so! Then I remembered a game enclosure that I used to visit with my children and drove there spontaneously. ‘So, where are your owls?’ I asked at the entrance. ‘You mean Frieda, our snowy owl?’ – ‘Yes, that’s the one’ I answered, delighted because I’d not expected them to have a snowy owl there. I found her in her huge aviary, sitting on the fence. Frieda looked at me with round yellow eyes. Warily? Curiously? I greeted her with a friendly ‘hello’, sat down on the grass in front of the aviary and began my portrait. The owl sat motionless on the other side, almost two metres from me. In complete contrast to her still stance, were the movement of her head, which she pointed here and there, and sometimes even turned 180 degrees, and her yellow eyes, which she sometimes opened to be large and round, and sometimes narrowed to be narrow slits. Suddenly I heard happy voices and a group of small children came running. Now Frieda will be off, I thought worriedly, as my picture still wasn’t finished. But she stayed sitting still and thoughtful while the swarm of children pushed the fence in front of her and probed their small hands through the chicken wire, trying to stroke her plumage. Nothing startled her, and I was truly thankful for that, as I wouldn’t have had a good view of her or have been able to paint her in one of the far trees. So we sat for some time, separated only by the fence, almost parallel and I could finish my picture in peace. Later, at the exit I discovered that some days you can go and see her flying. Good, I thought. I’ll be back!